Good morning! 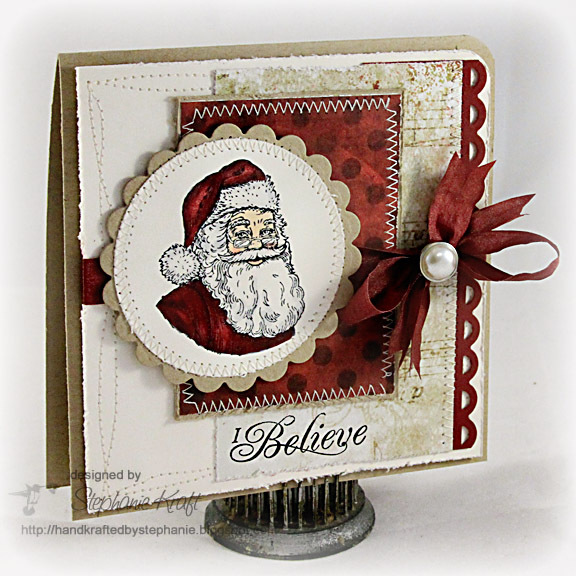 Today I am excited to share that I am the guest designer at Sparkle Creations Christmas Card Challenges! Initially, Sparkle started challenging herself to make 2 Christmas cards each week so that come December, she would have a great headstart on her holiday card stash. Eventually, she extended the challenge her blog readers and now she has a talented design team. I loved this idea and would try to play along as often as I could. It's been awhile since I've been able to play, though the thought often crosses my mind each Sunday. The challenge this week is to create a vintage Christmas card (can be a Winter, Hannukah or Holiday card). I thought this sweet Santa image from JustRite Vintage Christmas was just perfect for the challenge. I colored him with Copic markers and paired him with some new My Mind's Eye (from the Holly Jolly collection). I used Mercy's latest sketch, MTSC87, for my layout - such a fun sketch.. I loved it! Be sure to stop by the challenge blog HERE to see the rest of the designer's wonderful creations. Hope you will join us this week! Accessories: Small Classic Circle Nestabilities die 5, Small Classic Scalloped Circle Nestabilities die 4 (Spellbinders); Apron Lace border punch (Fiskars), Round-It-All (Zutter), Copic Markers (0, C00, C1, C5, E00, E02, R20, R89); Wrinkled ribbon (May Arts), Distressing tool (Heidi Swapp), Pearl brad, Foam tape, Thread, Sewing machine. Stephanie... I really love your vintage santa! The design is gorgeous as is the card! Gorgeous card, Stephanie! Love your sewing and what a GREAT Santa!! OH Stephanie--this is SOOOOOOOOOOO cute! I love the color story and the stitching....just beautifully done;) SOOOOOOO IN LOVE! Your card is stunning! I love everything about it. From the Santa to the stitching, it's all fabulous. Thank you so much for being our guest designer this week. Gorgeous Christmas card Stephanie! I love that JR Santa image - your coloring looks great! Such a beautiful vintage Christmas card, love that Santa! Ooo!! Is this ever rich and gorgeous!! LOVE your coloring!! And paired with that fabulous dp and sewing...WOW!! Such a beautiful card Stephanie. Love the vintage look with all the stitching and distressed edges. your coloring is fabulous.!! Such a gorgeous card! Thanks for being our GD! Gorgeous card! You always use design papers so well!